Ecosystem innovation today is more about managing beyond the immediate known found within one organization’s limited focus of the world. The race is to gain advantage and often try to dominate and influence the future direction a market will take. This requires a broader perspective, a greater diversity of thinking by tapping into varying levels of specialized expertise. Knowledge engagement – the ability to attract knowledge into the organization, through greater content and value, through the people involved and the way we anchor and diffuse this new knowledge. Intangible assets – increasingly people and the combination of their intellectual capital in knowledge, relationships and how they structure work will be the central focal point of innovation success. Conditions for innovation – we need to develop the ability to ‘sense and respond’ to shifts in markets, from the competition and evaluating these changes in ‘real time’ and we will become far more reliant on data and analytics for this. The organization that envisages a changing world needs to organize around ecosystems to deliver on that vision to gain the leading influencer’s position. Aligning partners on a platform needs-basis is very different from aligning them to just one organization’s needs. In the past we adapted to meet that specific requirement of that one dominant organization as they controlled the process. Today you can argue differently, why what you see as needed is not the best and maybe different from first envisaged, and it is better and evolutionary but demands more change and disruption internally. It allows for more breakthrough innovation, greater challenging of the existing status quo and often taking organizations out of their existing comfort zones. The ecosystem, through the use of technology, the cloud and a diverse set of collaborations will increasingly become the main stream for innovation inputs, accelerants and delivery value. We need to prepare for it, experiment, become involved in different offerings. 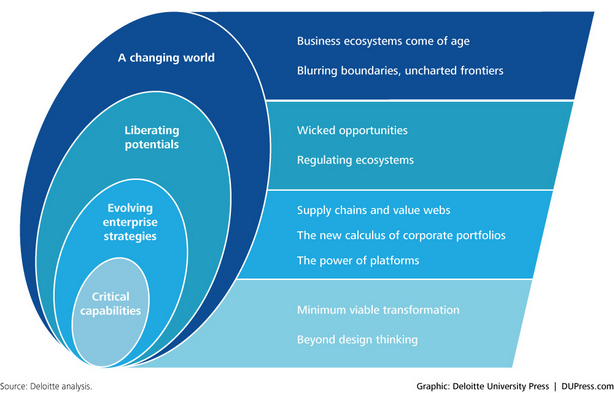 Platforms, strategic partnerships, new business models all will be on the agenda of any serious global organization and learning to deliver through this requires a radically different innovation system of management built around adapting and changing ecosystems. This entry was posted in Uncategorized and tagged articualting the business model, Building the future business, building the innovation business case, Consulting engagement concerns, Disruption of the Business Model, disruptive forces for innovation, Engagement and innovation, innovation ecosystems, innovation platform management, Innovation Structure, New innovation consulting business models. Bookmark the permalink.